Here's some end of the season Heirloom Tomato photos taken last week at the Santa Monica Farmers Market. Time Magazine recently named the iPhone 5 its Gadget of the Year for 2012, and as a food writer who was always looking for a phone that took decent food photos I most definitely definitely concur! Labels: Gadget of the Year, Heirloom Tomatoes!, iPhone 5, Tres Yum! 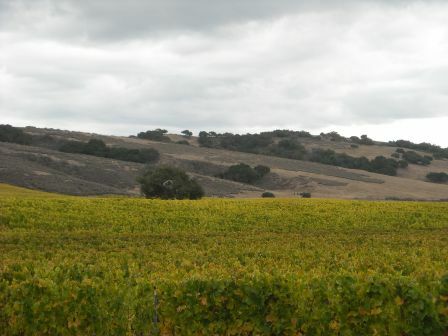 Rolling hills, cowboys herding cattle on horseback, and rows and rows of vineyards with tasting rooms. Just 35 miles north of Santa Barbara, wine tasting from the Santa Rita Hills to the Santa Ynez Valley combines all of the awesome elements that I embrace through the Edible Skinny: learning how what we put in our mouth is made, exploring the art of craft, and gaining knowledge that gives us the wisdom to decide what we should eat and drink. Our first stop for the wine tasting weekend was Firestone Winery (5000 Zaca Station Road in Los Olivos). The tasting room on the vineyard only does tastings of wine (if you want to do beer you need to go into Buelton to it's Tap Room.) Established in 1972 as Santa Barbara’s County’s first estate winery, Firestone Vineyards specializes in Sauvignon Blanc, Syrah, Cabernet Sauvignon, and Merlot. We did the $10 tasting which offered a Gewurztraminer, Chardonnay, Riesling, Merlot, Cab, and Syrah. It was interesting to note that at Firestone between tastings they washed out their wine tastings glasses with wine instead of water because they felt that it allowed for a cleaner glass. For me, the breakout bottle was the 2009 Gewurztraminer; dry and crisp, zesty and tangy with notes of citrus such as Tangerine and Pink Grapefruit: it had the potential to go great with spicy food. And at $14 a bottle (less if you join the Firestone Cellar Club) it was almost a steal. Foley Estates Vineyard and Winery located in Lompoc (6121 East Highway 246) is nestled in the Santa Rita Hills, one of California’s smaller AVA (an acronym for American Viticulture Area, which is American version the appellation system. 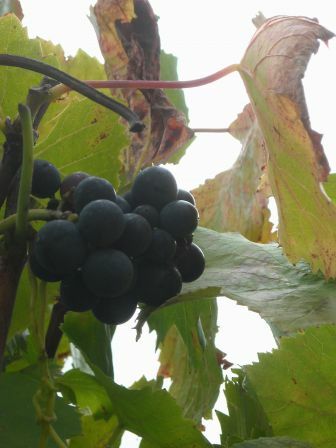 Unlike Europe, where there are tons of rules, in America the only requirement is that 85% of the wine must have come from grapes grown within the geographical AVA boundaries). This area is exposed to daily fog and coastal breezes from the nearby Pacific Ocean, helping to build up complex flavors which are found in the Chardonnay, Pinot Noirs, and Syrah’s that Foley is known for. Our tasting (a Rose, 2 Chardonnays, and 3 Pinot Noirs) had some great wines. My sister was in love with the 2009 New Release Chardonnay, Rancho Santa Rosa which was buttery to the core. Full of flavors of toast and vanilla this wine had a lovely long finish that showed our taste buds the difference between a $30 bottle of Chardonnay and Colombia Crest. I instead fell in love with the 2009 Pinot Noir, Bar Lazy S which tasted of both smoke and the sea. Caramel, Oregano, Vanilla, and Plum this wine was a symphony in your mouth! Wrote a travel article for the SM Observer on the Good Food Festival! For its second year the Good Food Festival & Conference returned to Los Angeles. Produced by FamilyFarmed.org in cooperation with the Santa Monica Farmers Markets, the conference’s mission is to be a connection point for the NGOs, businesses and individuals who are driving the Good Food Movement. The festival’s focus on regional and national issues that are integral to building local and sustainable food systems and educating people about the Good Food Movement. On Saturday, November 3rd, LACMA co-hosted a series of panel discussions on building organic and sustainable food systems. Topics include: Building Community with Good Food, Good Food=Good Jobs, Is GMO Labeling Coming to California? On Sunday, November 4th the Good Food Festival & Conference culminated with the fundraising event: Localicious. Held at the Annenberg Community Beach House in Santa Monica, guests savored the freshest and best of the season with signature dishes prepared by 30 of LA’s leading chefs paired with 30 farmers from the Santa Monica Farmers Markets. 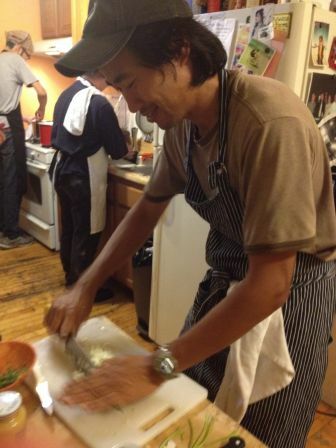 The event was a great way to meet some of the new players of the L.A. food world. One such player is the new restaurant Feed. Opening in early 2013 on Abbot Kinney Blvd., Feed will feature seasonally inspired menu of forward thinking California style dishes that are nourishing for the body and the soul. Full of both consciousness and craft the dishes served at Localious included: Vegan German Butterball Potato, Pumpkin Seed and Blackened Escarole Soup with Cashew Crème and Roasted Blue Hubbard Squash Salad with Baby Torpedo Onions, Red Kale, and a Labneh (which is a soft Middle Eastern cheese made from yogurt), Tahini & Preserved Lemon Dressing. With Chef Matthew Dickson formerly hailing from Grace, Malo, Rockenwagner & Vida, menu items will be sourced from local farmers markets focused on sustainable and organic ingredients. Feed will also offer an all-organic beverage program to include wine, beer, and spirits and feature locally sourced organic ingredients, homemade organic syrups and mixers. Another new kid on the L.A. food block is nano brewery Smog City Brewing, which celebrated its one-year anniversary in October. In the beginning Smog City was described as the “little brewery that could,” and they’ve definitely delivered. Last month in Boulder, CO their Groundwork Coffee Porter took home of the gold at the Great American Beer Festival, the Oscars of the beer world. With a taste that screams chocolate covered espresso bean, this robust Porter is aged on freshly roasted, freshly ground Groundwork coffee, which enhances the flavors of chocolate, roasted malt, and coffee (Of Course!) already present in the beer. The fun table at Localious (and there’s always a fun table at these events) was the new Hermosa Beach restaurant Abigaile. Serving toasted Crostini with sautéed mushrooms from Shiitake Happens Mushrooms Abigaile paired these tidbits with their house-brewed craft beers created by Brewmaster Brian Brewer. Brian’s philosophy on beer making is simple: bring only the freshest, high quality ingredients to the process. And with beer names like Orange Blossom Blonde Ale, Misfit Pale Ale, and Bourbon Vanilla Porter, it seems like fun is also part of the equation. 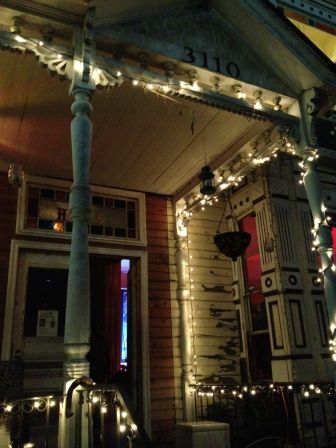 This coolness also translates to their space, as the location has been a church, an artists’ co-op, a rehearsal space for Black Flag over the years before becoming Abigaile, a place where their philosophy is that one of life’s greatest sources of joy is what happens when people come together to share a meal. Also speaking was Meg Glasser from Food Forward, SoCal’s largest gleaning organization who noted that by the end of this year they will have gleaned 1.3 million pounds in the three and a half years they had been around. Food Forward began in a grass roots way in 2009 when Rich Nahmias saw Tangerines on the ground in his neighborhood, so with the help of 3 of his friends he gleaned 800 pounds of Tangerines that day for SOVA food bank. Food Forward’s backyard harvesting now spans the gamut: from one tree at one home to 800 trees at Cal. State Northridge where they collected 18,000 lbs in 4 hours. Food Forward now has 50 receiving agencies, 4,000 volunteers, and is located in 4 different counties. One other panel member was D’Artagnan Scorza the Executive Director of the Social Justice Learning Institute. The Social Justice Learning Institute is dedicated to improving the education, health, and well being of youth and communities of color by empowering them to enact social change through research, training, and community mobilization. From the SJLI emerged the food program "100 Seeds of Change" Food System Initiative. 100 Seeds of Change is a comprehensive, city-wide plan to create urban gardens at homes, local schools, city parks and other locations with city youth & community members in the city of Inglewood. The goal of this initiative is to transform Inglewood into a healthy living community by empowering residents to collaboratively be active in growing their own food in a local network. In the end, the food grown within this network will create Inglewood’s first complete local food system that is sustainable from the ground to the plate. “We don’t give ourselves enough credit for the impact we’re making in creating these food communities. Seeing a child who’s never tried Chard before, that’s what feeds me,” noted Scorza. 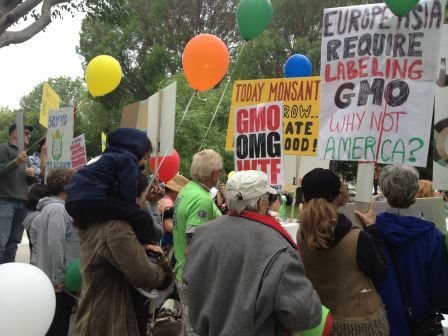 Although the United States does not require the labeling of Genetically Modified Organisms (GMOs), 61 countries around the globe do (including the entire European Union, Brazil, and China). Those who advocated for labeling in the state of California were definitely the underdogs as the world’s leading pesticide and processed food companies outspent “Yes on 37” by more than 5 to 1, and beginning on October 1, spent about a million dollars a day on anti-labeling advertising. And in a nutshell that is what the Good Food Festival & Conference was all about: choice, fairness, transparency, and education in all the varied elements, big and small, surrounding what we eat. Took some new photos at the Santa Monica Farmers Market with my niffty difty iPhone 5. The bestest phone camera yet! Check out the results! A fun video for Prop 37. 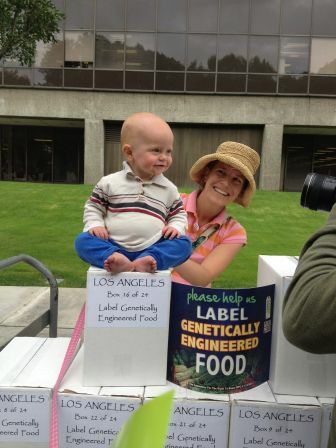 Please vote Yes on Tuesday for California's right to know if there's GMos in our food! Wrote an article for the SM Observer on Food Forward's Farmers Market Recovery Program at the Wednesday Santa Monica Farmers Market! Enjoy! The best solutions to problems are sometimes the simplest. Taking a step back and utilizing an asset that you never even realized was there. Eight weeks ago Food Forward launched their Farmers Market Recovery Program at the Wednesday Santa Monica Farmers Market. On their first day at the Wednesday Farmers Market the Food Forward’s Farmers Market Recovery program gleaned 1,313 lbs! Along with two other markets (Studio City and Hollywood) at their two month anniversary they’ve gleaned a total of 14,777 lbs (7.4 tons) of excess produce from 82 farmers across 9 local receiving agencies (all within 5 to 7 miles of the market they’re gleaned from). And how does this simple solution work? Food Forward “Glean Team” volunteers arrive at the market ready to glean in their bright blue caps and khaki aprons and issue collection boxes ornamented with the Food Forward logo to the farmers. 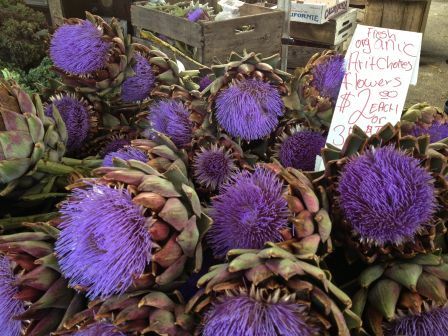 “Food Forward’s Farmers Market Recovery program is a very active, involved, and passionately committed group of individuals,” observed Laura Avery, the Farmers Market Supervisor for the City of Santa Monica. The farmers fill the boxes with their unsold excess produce. At the end of the market, the Food Forward volunteers collect the boxes and distribute them to their receiving agencies. These generous farmers receive a quarterly donation letter from Food Forward, which they can use for tax purposes. And, as Laura Avery notes, “most importantly, they know the food they grow with such love and care is going to help feed Santa Monica’s and Venice’s most vulnerable families and individuals.” In the few months Food Forward’s Famers Market Recovery program they have gleaned enough prized produce to serve over 37,900 meals to over 20,000 people in need. And what exactly does that gleaning word mean? Gleaning, which has been around since the Old Testament, is the act of collecting leftover crops from farmers' fields after they have been commercially harvested or on fields where it is not economically profitable to harvest. These two 501.c.3 organizations clients happily use 100% of what the farmers donate each week. Step Up on Second uses 100% of produce in their 200 prepared meals they serve each day, serving over 3,000 clients each month. St. Joseph Center uses 80% of produce in their Client Choice Food Pantry serving 600 clients daily, and the rest in their Client Culinary Training Program. Both agencies use 100% of the produce within 3 days; most is used within 24 hours. All items are stored in walk-in refrigerators; Food Forward conducts site visits quarterly. Food Forward’s mission is to engage volunteers to harvest locally grown food from private homes and public spaces, which is then distributed to local food pantries and organizations serving those in need. Along with their Farmers Market Recovery program Food Forward convenes at properties they have been invited to and harvest their excess fruits and vegetables, donating 100% to local food pantries across southern California. Since forming in 2009, they have harvested/rescued over 1,000,000 lbs of fruits & vegetables at hundreds of properties with 100% of what they pick going to feed the hungry. “The way they’re growing and reaching out in the community it seems that it’s a program that just has no end in sight. We could not be happier to have them here,” continued Laura Avery. And Food Forward is constantly building a Farmers Market Recovery community. A group of passionate food advocates who sit at the intersection of Farmers, Market Managers, and Receiving Agencies. They’re about getting things done instead of talking about getting things done, as they like to say “less talk, more rock.” They serve local community members in need, and they want to keep growing. If you are interested in joining this Farmers Market Recovery program, drop a line to Mary Baldwin at fmrecovery@foodforward.org. 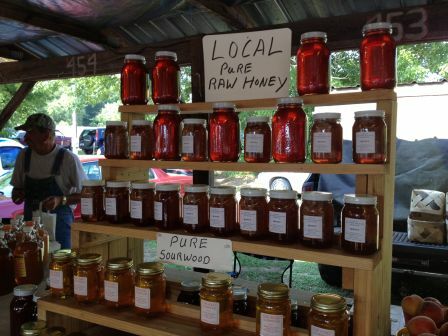 I just got back from the mountains of North Carolina where at every Shoppe (with two p’s and an e) they were selling Sourwood Honey. Since I was unfamiliar with the variety I did a little investigating. Honey connoisseurs everywhere seek out Sourwood’s deep spicy flavor. Its texture is defined by a smooth, caramel buttery quality with color ranging from pure white to light amber with a grayish tint. Sourwood honey’s flavor is flowery with hints of baking spices and anise. Some people say it recalls the flavorings of gingerbread with a “twang” in the aftertaste. The Sourwood’s scarcity can be attributed to the very small amount of trees currently growing. Indigenous to the United States, the Sourwood tree (also called the Lily of the Valley tree or the Appalachian Lily tree) is a medium-height tree. It grows on the east coast from southern Pennsylvania to northern Georgia. Along with limitations of geography, the trees are constantly threatened by development. Because purity is key, beekeepers must be trained to have great critical timing skills and attention to detail. The trees typically bloom from June to August, a short amount of time in which beekeepers can bring their colonies to the trees to collect nectar from the flowers. The parameters for classifying the honey are very strict; if it has even small percentages of other varietals it can’t be sold as Sourwood. This is honey is so rare that a good crop sometimes only surfaces once every decade. Wrote an article for the SM Observer on the Santa Monica Omusubi restaurant Sunny Blue. Sunny Blue, the only omusubi shop in Santa Monica, actually the only omusubi shop Southern California, just turned two years old. Co-owned by the cheery Keiko Nakashima, along with her father Mitsuo Numano, this teeny tiny Main Street restaurant is packed with customers of all folds. From adventuresome foodies to frugal students to local families they all come together to create a community of omusubi lovers. How Sunny Blue came to be was the result of a whole lot of kismet and international travel. Keiko was born in Japan, raised from elementary school to sixth grade in America, she then moved back to Japan for middle and high school before returning to the States permanently for college. “I went to FIDM where I majored in merchandizing. I always knew what I wanted to do, or at least I thought I knew what I wanted to do. After college, I got my job and got married right away.” But after spending years being a homemaker, she has four children between the ages of 10 and 18, Keiko found herself somewhere she would have never expected herself to be. “When I was in elementary school I would tell my mom, ‘please don’t make me that for lunch,’ because the kids would tease me. It’s definitely ironic that I’m making omusubi now.” Keiko notes that many of her Japanese American customers have similar stories. “We all went through the same thing; it’s really crazy.” How she ended up owning a popular restaurant selling the one thing she abhorred as a child has fate written all over it, fate and Pinkberry. It all started four years when Keiko’s father, Mitsuo came over from Japan for a visit, during the Pinkberry boom. “My parents had come to visit and I was taking them around L.A. and I told them, ‘I need to show you this yogurt place. It tastes just like the yogurt places of my childhood in Japan.’” Her parents loved it, and they weren’t alone. At this time yogurt shops were exploding all over Los Angeles with the force of a tsunami wave. In the beginning Sunny Blue offered six different omusubi flavors, by comparison they are now offering twelve flavors along with side dishes. Sunny Blue’s staff impregnates each omusubi full of filling of Keiko’s own design such as Spicy Salmon, cured salmon with chili seasoning, or Miso Mushroom, stuffed with king oyster mushrooms and enoki mushrooms sautéed with ginger miso sauce. All running in the choice price range of two to four dollars each. Each omusubi at Sunny Blue is individually prepared and served on a taco-truck style paper plate, convenient for takeouts. 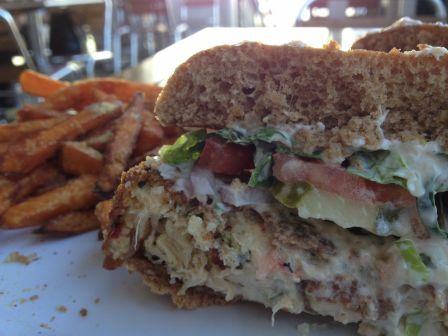 They offer five different Vegan options for the non-meat/ non-dairy crowd. Naming it Sunny Blue was her Dad’s thing. “He was inspired by the founder of Sony, who originally wanted to name his company ‘Sonny Boy.’” The story goes that they ended up shortening the name to Sony for pronunciation reasons, but Mitsuo wanted to use “Sunny” to reference his hero. And the “Blue,” it represents the ocean that connects Japan and California. But Sunny Blue isn’t just for locals anymore. “We were recently in the Frugal Finds section of L.A. Magazine. It’s driven a lot of customers here.” Sunny Blue has a really good Internet record; “we’re usually number one on Yelp for Santa Monica Cheap Eats and three or four in all of Los Angeles.” But even as the non-locals pour in Sunny Blue will always have the hearts of Main Street Santa Monica. People (including me) are always showing beautiful pictures of the food that comes from Santa Monica Farmers' Market, but the behind the scenes aspects like the boxes never get that much play; that is until now. Just remember that for every artichoke, tomato, or orange sold there's a box that housed it! A great trailer (directed by Sekou Luke) for Behind the Kitchen Door: What Every Diner Should Know About the People Who Feed Us, a book about the exploration of the political, economic, and moral implications of eating out. The book investigates what's at stake when we choose a restaurant. Not only our own health or "foodie" experience, but the health and well-being of the second-largest private sector workforce, the lives of 10 million people; many immigrants, many people of color, who bring passion, tenacity, and important insight into the American dining experience. A great methodical TED talk by Robyn O'Brien about why you should learn more about the world of GMOs and demand that we label our foods. Robyn O'Brien is a former Wall Street food industry analyst, Robyn brings insight, compassion and detailed analysis to her research into the impact that the global food system is having on the health of our children. She founded [www.allergykids.com|http://www.allergykids.com/] and was named by Forbes as one of "20 Inspiring Women to Follow on Twitter." The New York Times has passionately described her as "Food's Erin Brockovich." Last week I had the pleasure of meeting Thomas Rekasis (the blurry guy in the background) the Food & Beverage Manager/Spirits Buyer for Viceroy Santa Monica Hotel. Thomas merrily told me how the Viceroy’s Cameo Bar now offers barrel aged cocktails featuring spirits produced strictly in California and aged on the premise in oak barrels. Utilizing spirits from California distilleries such as Sonoma County’s 1512 Spirits run by a Bay Area Barber (the distillery is named after his day job the 1512 Barber Shop. (And yes you read that right, Nob Hill Barber by day, artisanal distiller by night!)) 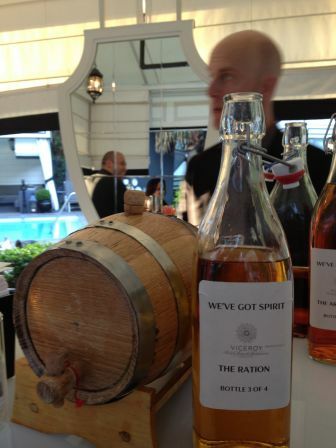 As part of its We’ve Got Spirit program, the Viceroy is now offers 2 cocktails aged for a minimum of 2 weeks in oak barrels. Each barrel produces no more than 3 liters of the cocktail it holds. When it’s ready, they pour. When it’s gone, it’s gone. The most tantalizing is the Ration, a drink that was first concocted by Thomas’ grandfather. The Ration is a combination of rum, bourbon, brandy, and orange liqueur that is then stored in a mini whiskey barrel (which I didn't even know come that small) for 3 weeks. After such time it is removed from the barrel and distributed to bottles. Each bottle then has ½ cup apple-wood chips added to it before it is sealed tight. After being aged 1 week the cocktail is then muddled with lemons, oranges, and a pinch of loose mint. It's shaken, strained over ice, and served in an old-fashioned glass with an orange and lemon peel for the perfect sunset drink. So get it while it’s good because when it’s gone, it’s gone. To say that my dad, Tony Thomas, is handy is as much an understatement as saying that food is a complicated and fascinate subject. So when he decided to devise a rainwater collection contraption to self water his tomato plants when he’s away (and save money on an expensive water bill) he became a man on a mission. Since the entire point of this endeavor was to recycle the natural abundance of Southern Florida (where rain is ubiquitous) he made to sure to use recycled materials whenever possible for the project. His first step was collecting gutters, which were being discarded from a new roofing job. On the logistics sides he had to add down spouts and end caps, cover the top of the gutters so leaves and debris does not enter the system, and paint all the items for esthetic values. 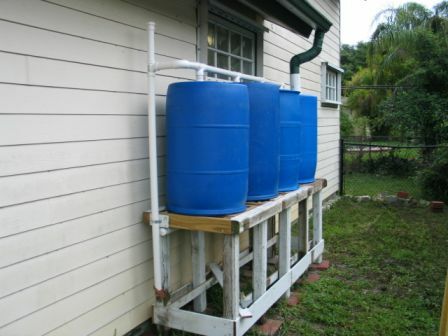 Before setting the rainwater barrels, he had to build a stand to elevate them so he could obtain the pressure to push the water to the plants. This material was also recycled as it was discarded fencing material intended for a landfill. Once the base was built he could start with the barrels. First he gave them a good washing. 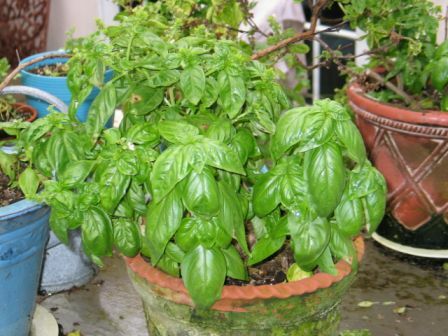 Even though they were food grade (some had contained vegetable oil) and he wanted them as clean as possible (very important even for just watering plants). The barrels, which are inverted so that they will self-drain and do not need a pump to dispense (only gravity), were placed on the stand and connected in a series with a manifold arrangement. Similar to punching a vent in a can, none of the barrels would drain if they were not all vented. The arranged PVC venting/overflow system at the top was devised to vent all of the individual barrels and should they all fill up to overflow out to they bottom of the vent stack. The vent stack was screened at the top so no insects could lay their eggs in the water and the bottom of the overflow has a pantyhose rubber banded over the end (Green yet again) so insects couldn’t invade that way either. Tony (aka Dad) then added the facets at the end so that he can place both a timer (attached to the drip hose which will run throughout the beds when he’s away) and a regular hose to water individual plants. When I talked to him about this adventure he said it was raining hard that night and that he should have 220 gallons before the night was through. Super handy and super Green (both environmentally and fiscally)! I just spent the weekend in the desert for Coachella and it was un-freaking believable!! 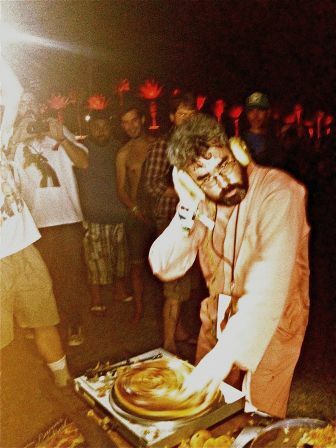 The world's largest music festival will be exactly what you want it to be and for two gentlemen that meant dj-ing with baked goods and pizzas. 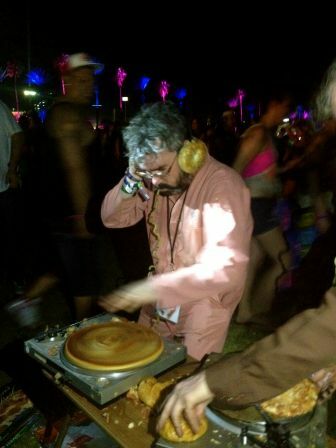 And if there was ever an audience for that particular type of food/music mash-up it's at Coachella, so spin away guys! A couple of weeks ago I went to a tasting of the new menu items at Veggie Grill (the 100% plant-based comfort food restaurant). While we were waiting for our first item on the list, I informed my tablemates how I had walked away from Natural Products Expo West with the feeling that everyone was getting very close to the real deal in the world of plant based substitutes with things like chicken, but that nobody could master the art of seafood. And within a minute I had to totally eat my words because Greg Dollarhyde, the CEO of Veggie Grill placed their new Crab Cake sandwich in front of me to taste. I took a bite and the first words out of my mouth (honest, truly!) were: How is this possible? 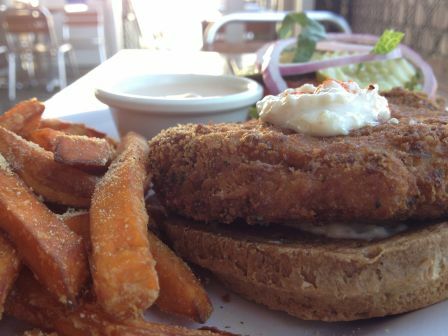 A crispy “Crab” Cake with tangy tartar sauce, pickles, tomato, lettuce, and red onion along with a side of “sweetheart fries.” As a beach girl who grew up eating seafood in all forms (but the not the case anymore) I was totally hooked! 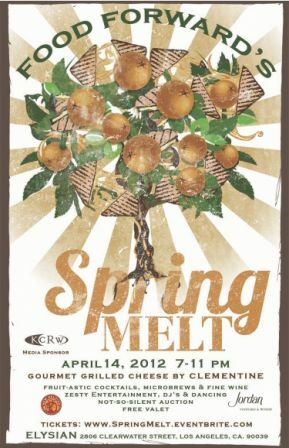 Something to Check Out: Food Forward's Spring Melt on Saturday! My friends over at the amazing non-profit FOOD FORWARD are having an awesome Grilled Cheese event this Saturday night Elysian in Silver Lake. If you're looking for a kickass amount of Grilled Cheese (and a kickass cause!) please consider checking them out! The Deets are below. We are in the final days leading up to our SPRING MELT fundraiser and it’s the LAST CALL to purchase your ticket! With less than 20 TICKETS REMAINING, we hope you take the opportunity right NOW to PURCHASE your ticket to our fabulously exciting Fruit-Bash!!! With the purchase of your ticket you can expect an AMAZING assortment of zesty entertainment, a full menu of gourmet grilled cheeses and delicious eats from Clementine + an open bar with beer from New Belgium Brewery, our famous Grapefruit Forward cocktail and wine pours from Jordan Winery. The night is sure to be fun-filled, with comedianne extrordinaire Beth Lapides as our evening’s Mistress of Ceremonies. Bushels of entertainment will include everything from interactive visual environments by international video artist Jesse Gilbert, sets of juicy dance tunes spun by DJs Fucsia and Matt Franke, to rolling up your sleeves alongside Miss Rhea Purpose at her ridiculous DIY Kraft Korner, plus other zesty surprises! There will be a shared abundance of door prizes throughout the night, and a not-so-silent auction as only Food Forward can do it - featuring a bounty of outstanding items for all checkbook sizes: temptations for foodies, book worms, wine snobs, movie buffs, health nuts, sports fans and so much more. Don’t worry, we have parking covered too with free valet service all night. Come support the work of Food Forward to harvest food, fight hunger & build community and have a juicy fun time while you’re at it!